A Christian response to poverty in Britain today. When you think of poverty in Britain today, do you picture innocent children going without food or scroungers lounging on the sofa all day watching TV and cheating on benefits claims? For Christians, what we think about the poor in our nation needs to be shaped by biblical values, but can so often be framed by the dominant narratives of the day, which affect our attitudes and actions. Have we fallen for the myth of the undeserving poor? "Their repudiation of the stigmatisation of the poor as benefits cheats, as a feckless underclass of chavs and scroungers, is as welcome as their practical suggestions"
"Is your reaction to poverty shaped unthinkingly by the media and by politicians? Don't let them do the thinking for you. Everyone should read this excellent and challenging book." "This book sets out the Church's responsibility to walk with, as well as to serve, the poor amongst us. Along the way, it powerfully challenges stereotypes, and encourages deeper, constructive and longer lasting engagement with the issues that cause and sustain poverty, as well as the way our attitude and actions need to change. This is an important and helpfully provocative book." "A very informative, intelligent and challenging book. The book begins by looking at the history of how the church has been involved in looking after the poor in Britian throughout the ages since the early Celtic church, the Roman Catholic Church, through the reformation and carried on by the Anglican Church and later by the Methodists and then into the 20th Century evangelical movements. It honestly looks at how the church retreated from social action in the second part of the 20th century with the rise of secularism and liberalism and increasing state benefits from the wealth fare system and the national health. It then goes onto look at how the state has started to withdraw some of this help and how attitudes in Britain have changed towards the poor since the 1980s and into the most recent recession of 2007/2008. The authors discuss how these attitudes have been influenced by the media in a negative way. They further look at how the church in 21st century Britain is starting to respond to these attitudes and the rise of poverty, with food banks, debt advice, credit unions, job clubs, toddler groups and much more. Particularly interesting, is how the church has franchised these ideas and are replicating them all over the country. The book then returns to the bible and explores how and what God sees as poor and how the Jews in the Old Testament, and then Christians in the new testaments should treat and look after the poor. Basicall, the book is calling all Christians to think ! and not just believe all that we see and hear in the media, to read the bible and act out what it commands us to do. I highly recommend reading this short but challenging book." "This is a profound, timely and challenging read. At the heart of the book is a challenge to be aware of the powerful media messages constantly shaping our views, and challenging the reader to hold on to a more compassionate and biblical view. However this book is also well researched and objective in its overview of the subject. A must read for anyone choosing to make a difference to UK society in the 21 st century." 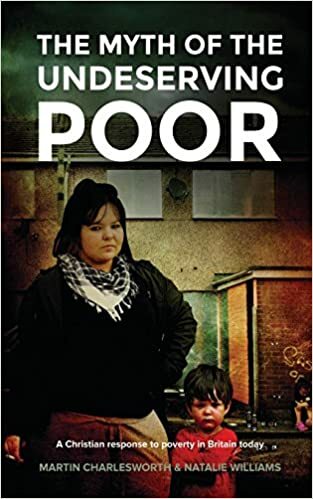 "This is a succinct and timely book, which considers how "the poor" are viewed both historically and in the UK at the present time. Recent media analysis highlights a shift in agenda towards those in poverty, but the historical analysis shows it is nothing we haven't seen before. Like in previous generations, the Church has a mandate to help speak up for the value of those in poverty, alongside practically helping them." Copies of this book are available to purchase on Amazon in both paperback & kindle formats.